Announcement NEW FOR April 2019! MODular Earring Stabile Sculptures, your earrings become the kinetic part of the modern art sculpture when you're not wearing them. 14 new animal inspired stabiles - cute kinetic desktop mobiles for your home and office, and Atomic Screens. I've been busy! 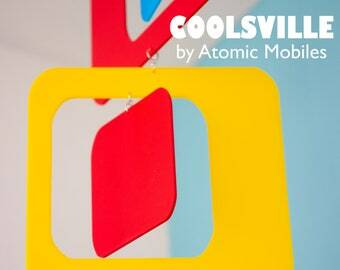 Also new: 4 Vertical Mobiles -- Retro-A-GoGo, Beatnik Party, Coolsville, and Groovy. These mobiles are long and narrow and brighten up a forgotten corner, entryway, hallway, or skylight. I'd love to make something unique and wonderful for you! You love mid century modern anything, right? So why aren't you enjoying a calm zen-like mobile in your modern space? Yes, let's do this! I make high quality hanging art mobiles out of acrylic, and stainless steel for years of beauty. Don't think your ceiling is tall enough for a mobile? Think again! Mobiles can hang even from normal ceiling heights, pick any lonely corner and spruce it up with delightful color, movement, and style. Hang a mobile over a beloved chair and watch the space come alive with gentle free flowing movement. I also create desktop mobiles, called "stabiles". Set it on a coffee table, shelf, desktop, or any table, and enjoy, no hanging needed. I love mid-century modern style, Eames, Knoll, Palm Springs, Atomic Ranch, and modernism and I bet you do too! I also love modern art, Dada, Marcel Duchamp, Man Ray, Moholy-Nagy, Hans Arp, the avant-garde, pop art, abstract expressionism, and more. My custom art mobiles are completely handmade to order by me, Debra Ann, in my studio in Los Angeles. My work is in high demand which truly is amazing! I'm an artist who actually sells her art (wow!! ), I feel very very fortunate and grateful. I make each custom mobile carefully to ensure a high quality art piece that you will love for years. Each art mobile is custom made by me - Debra Ann - when you order. My turnaround time is approximately 7 to 21 days depending on the size of the art piece and my backlog. Please allow 2 - 3 days for shipping time via USPS Priority Mail within the USA (1 to 2 weeks shipping time international). If you need it sooner, please let me know and I'll see what I can do to expedite things. In this age of poorly mass-produced-made-in-China cheap products, it will be well worth the small wait to own a custom art piece that was custom handmade ESPECIALLY FOR YOU to be enjoyed for years to come. I truly appreciate your support! NEW FOR April 2019! MODular Earring Stabile Sculptures, your earrings become the kinetic part of the modern art sculpture when you're not wearing them. 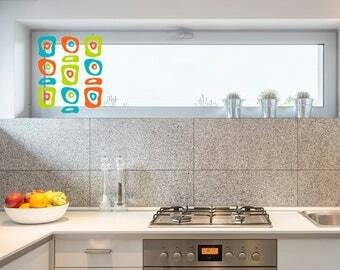 Retro-A-GoGo Vertical Hanging Art Mobile in Dramatic Black - 3 Sizes to Choose From - Mid Century Modern Abstract Style! A beautiful, handmade mobile! It arrived in good time and was very well packed. I recommend the mobiles in this shop! Beautiful! Great packing, great communication— many thanks! I have 15 different Styles available in many sizes and over 30 colors! Custom hand made when you order by me. I create modern art in the form of hanging mobiles and tabletop stabiles from my studio in Los Angeles, California. My work is hanging in homes and businesses worldwide, including almost every state in the US, Canada, UK, France, Australia, New Zealand, Japan, Germany, Portugal, the Netherlands, Belgium, Spain, Italy, Israel, Dubai, and more. I have been a self-taught artist since I was a kid. I've always loved creating paintings, drawings, cartoons, sculpture, music, and writing. I remember my 5th grade teacher back in the Midwest, Mrs. Ward, was obsessed with mobiles and we were given a classroom project of creating one. She pondered out loud how to make the shapes perfectly cut (die-cut them, but how?) and that memory sticks with me today. Born in Indiana, I moved to San Francisco in 1990. I lived in the Bay Area for 16 years in The Haight Ashbury and Marin County. I've been online since 1995 selling my art and music through my own mail order company. In those amazing early days I taught myself html, website design, and Photoshop, and I've never looked back. Art is not only very enjoyable for me - it is my world. 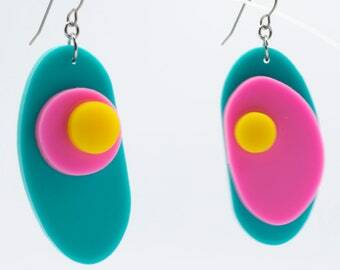 I make modern art mobiles that bring color, form, and graceful zen-like movement to your home, office, or nursery. I love the way mobiles look and move, so subtle and gentle. The look is decidedly modern. An art mobile adds the finishing touch to your room decor and compliments such furnishings as Eames, Nelson, Knoll, Bertoia, Noguchi, Saarinen, Jacobsen, McCobb, Wegner, and Herman Miller. Whether you own an Eichler, 50's atomic ranch home, Alexander, Wexler, a contemporary home, a shotgun in Louisana, victorian in San Francisco, brownstone in NYC, or anything in between, a hanging mobile will add the modern style, the finishing touch, to your beautiful room. I absolutely adore modern art and have been creating custom art mobiles by hand for a decade. My influences include Dada, abstract expressionism, Ray and Charles Eames, mid-century modern aesthetics, Man Ray, Marcel Duchamp, Hans Arp, Moholy-Nagy, pop art, the avant-garde, and so much more! Each art mobile is custom made by hand by me, Debra Ann, and includes a Certificate of Authenticity, hanging instructions, nylon wire and hanging hooks. Each mobile is fully assembled and hanging is easy and each mobile includes full instructions and all necessary nylon line and hooks. 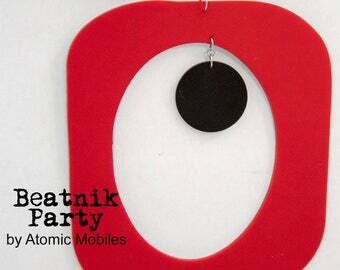 To see my full line of custom art mobiles, please go to http://www.AtomicMobiles.com. Each item is unique and custom handmade to order, but I want you to love your Atomic Mobile, so I offer returns within 14 days of delivery. Please inspect your piece(s) immediately upon arrival and report any discrepancies or issues within 7 days from the date of delivery. If you have any concerns, please email me at hangingmobiles [!at] gmail.com and I will work with you to resolve any issues. 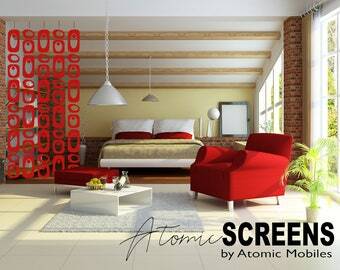 Every Atomic Mobile and Stabile feature a LIFETIME WARRANTY. If it ever gets damaged or broken I will send you a replacement or repair the mobile, at no charge to you. I accept PayPal, Etsy Cards, money orders, and all major credit cards: Visa, MasterCard, Discover, American Express. My custom art mobiles are completely CUSTOM handmade to order by me, Debra Ann, in my studio in Los Angeles, California. I'm a one-person company, I do everything from custom art fabrication, website design and updates, answering emails, packing and shipping, accounting - pretty much everything. My work is in high demand and I make each custom art mobile carefully to ensure a high quality art piece that you will love for years. Therefore... please allow about 7 to 14 days for me to make your art mobile, and 1 - 3 days for shipping via USPS Priority Mail within the USA (6 to 10 days for International shipping). If you need it sooner, please let me know and I'll see what I can do to expedite things. In this age of poorly mass-produced-made-in-China cheap products, it will be well worth the wait to own a custom art piece that was custom handmade ESPECIALLY FOR YOU to be enjoyed for years to come. I truly appreciate your support and patience! I also do custom orders. Want a different color than what you see here? No problem. I can do that. Need a custom size? Just let me know what you need, and chances are I can do it for you. Just contact me, and feel free to email a picture of the room you want to hang a mobile in and I'll make a Photoshop mockup just for you. Send me a convo and we can chat. Yes, I can create custom pieces to complement your decor and ideas! Send me a pic of the space you want to hang a mobile in and I'll create a Photoshop mockup for you. Send me a convo. Most Small and Medium (and some Large) sizes will work with any normal ceiling height, which is 8 feet here in the USA. You can hang a mobile over a chair or credenza, in a corner, or really anywhere people won't walk into it. Everyone should have at lease one mobile in their home! 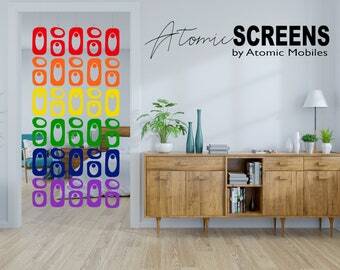 Caring for your Atomic Mobile is easy. Just dust it off once in awhile. Don't use any chemicals or abrasive scrubbers, ever. Just dust it off, or use a soft cloth to wipe it off occasionally. Most mobiles are packed in a long tube-like box. If you require a card and gift wrapping please let me know. I'm currently not accepting wholesale accounts. Yes, I can do a wide variety of colors and sizes. Please contact me with your ideas and requirements.